I wanted to write about my wedding dress because it was really such a special thing. After we set a date last fall, I knew that I would want to have a dress made for me. I was way too terrified to visit a bridal gown shop (I probably should have at least made a stop at White; a friend just bought her dress there, by Sarah Seven, and it is beautiful). I knew it would be hard to find the right vintage dress, there are no heirloom dresses in our families (my mother rented hers, Geoff’s mother wore a blouse and skirt, & I have no idea what our grandmothers wore), and for a while I contemplated making one myself as Melinda did. 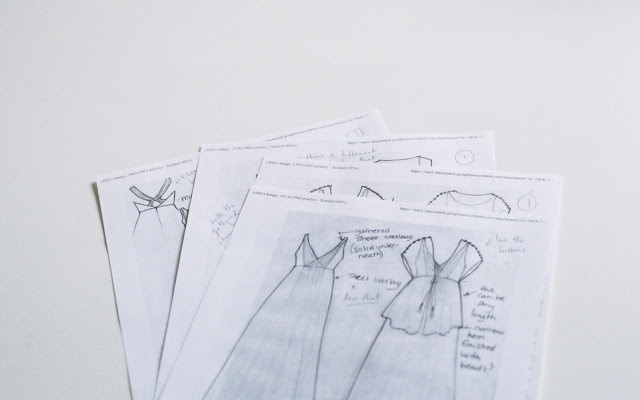 A few years ago I took a patternmaking class with Kristiann at The Workroom. She had studied fashion, worked as a stylist, and obviously knows her way around a pattern seeing as she has her own pattern company. We had a few encounters in the years following the class, and she was always the loveliest. I wrote to ask if she would be willing to make me a wedding dress, and even though it’s not something she does, she agreed to do it. I was thrilled. 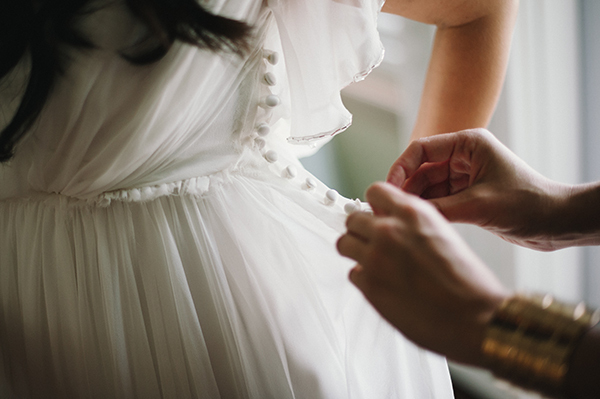 I loved the idea of someone who is so positive and who has such a good heart making my wedding dress, as though she could literally sew love right into it. We met for coffee, and I gave her a printout with some dresses that had elements that I liked, plus some ideas for details (I later joked to my bridesmaid Erin that the dress was the dress that Pinterest built because we cobbled it together from things like this and this and she laughed at me so hard. I laughed too). I wanted something flowing, made of silk chiffon. I didn’t want lace, because as much as I love lace, good lace is hard to find. I wanted pretty petal or tulip sleeves, mostly because I wanted to rebel against the notion that a wedding dress has to be sleeveless (what is UP with that? It’s a sea of sleeveless/strapless out there). I wanted a cape back like the dress in the Chloé ad. A little while later Kristiann sent me some sketches, and they made me wish that she could make five dresses for me. Most of them had a vintage feel without being costume-like. She also told me that some of my ideas just weren’t going to work, because she has an innate knowledge of fabric. For example, the cape back wouldn’t really be possible if I wanted sleeves. I chose one of the designs, and after she draped me, I ordered 20 yards (!) of silk chiffon. I also developed a Jenny Packham/sequin/bead obsession at some point and spent ages hunting for appliqués. I found these and asked Kristiann to try stitching them in, just to see. They ended up being one of my favourite parts. I love my dress. It was light as air. All the gathered fabric at the waist didn’t exactly make for a flattering silhouette (in the sense that when people say “flattering” they usually mean “makes you look skinny,” another idea I would like to rebel against) but I felt amazing in it. Kristiann stitched in some metallic silver thread at the back shoulders that tied in a bow to hold the heavy appliqués in place, but it was hidden by my hair like a sweet secret. She also stitched beads along the sleeves to add weight so they wouldn’t flutter too much. The removable train got completely destroyed (it had burrs in it? Burrs! ), and even though it’s been cleaned, there are a few faint red wine stains at the hem. It was still summer on our wedding day, and I was comfortable. I wore a long-sleeved blush-coloured beaded jacket at the end of the night, one that I bought on clearance at Club Monaco at Christmas and set aside. I got called “Primavera” (in reference to the Botticelli painting) that day, which is probably the best compliment I have ever received in my life. Obviously my Lou Lou Loves You crown was part of that. Kristiann wrote about making the dress here (I had no idea she had been so nervous). Thank you so much, Kristiann! Speaking of beautiful things custom-made for me, yesterday I received this amazing necklace in the mail from Sarah of Cursive Design. She made me a special Sunset necklace using a detail from the image on our wedding invitations and sent it as a gift. I could cry, I love it so much. Thank you, Sarah! What a beautiful dress (and story). So unique and elegant. It's such a beautiful dress. The details are so delicate. And now you have an heirloom dress! That hadn't occurred to me, but I guess you're right, I do! Thank you. Thank you! I have been joking about starting a line of bridal gowns that are specifically for women who want sleeves and/or have tattoos they want to hide (the sort they got when they were 18... oh dear). What an absolutely stunning dress, love the detail on the shoulder! Thank you! Yeah, the shoulders are really special! your dress was beautiful. 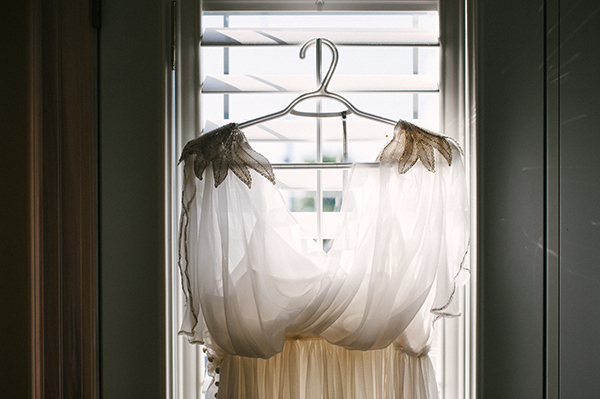 so airy and dreamy and different from the sea of wedding dresses that I see so much on girls. Thank you! I hadn't known what I wanted, but I ended up getting just what I wanted! The dress turned out so gorgeous! I love that it looks super dreamy without seeming fussy and hard to wear. Thank you! Yeah, other than the buttons taking a few minutes to do up, it was very fuss-free. Perfect for me! Man, I feel you on the sleeves thing. I ended up going strapless even though I really wanted sleeves, but I wanted a short dress so that upped the frustration. I ended up going with a j.crew bridesmaid dress. I absolutely love the appliques. The dress turned out amazing. That's so awesome! I always want to high-five people when that happens. I have a friend who wore a dress from BHLDN that was actually a bridesmaid's dress but made a beautiful wedding gown. Plus it was so much cheaper! Haha, so true! I bought the same dress in bright pink and wore it to our reception and the two dresses were still half the price of a traditional gown. The pink confused people, though. I walked by some lady at our venue and she said, oh look, she's in the wedding and I wanted to reply, I AM the wedding, lady. Thank you! And yeah, I love the buttons too! Aw, thank you, that is so nice! Kristiann made it feel like a pretty easy task, luckily. I never worried once! i would want something special like this as well.. perhaps a vintage dress? Yes! I would have loved a vintage dress too but I don't have a vintage-friendly bust size, ha! The dress is so beautiful and unique, just like you <3 And I just adore that necklace. It seems like you are surrounded by such loving and creative people! Thank you! And I really am... I am very lucky to know so many creative, talented, and thoughtful people. how did i miss this? your dress is so incredible. love the sequin appliqués on the shoulders. amazing. 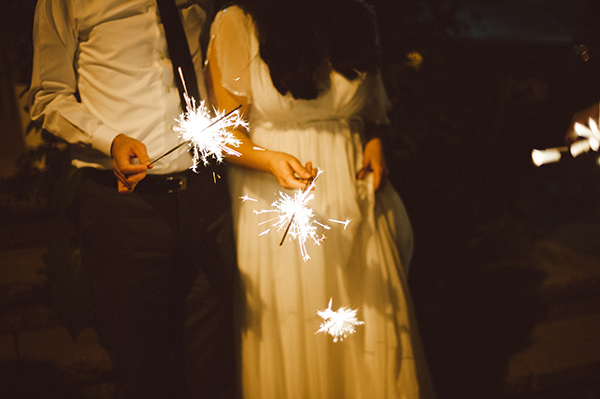 i love how the beads catch the light from your sparklers in that picture. also, that necklace! so amazing. looks art deco-ish. hadn't heard of White before but I see they carry my wedding dress designer, Rivini! what a nice surprise. she was wonderful but I think having a friend make your dress makes it all the more special for your day. going to check out her post about your dress. is 'Primavera' one of the three graces, because that is what you are like. Thank you so much! I'm glad you caught the light in that sparklers picture because that's exactly why I posed it. Actually! Maybe they meant Flora! Because the painting is called Primavera, but the women depicted in the centre are the three graces, Venus, and Flora. GORGEOUS!!!!!! I love the necklace...and such a special gift! Thanks, Riz! And yeah, Sarah's the best! What a pal. 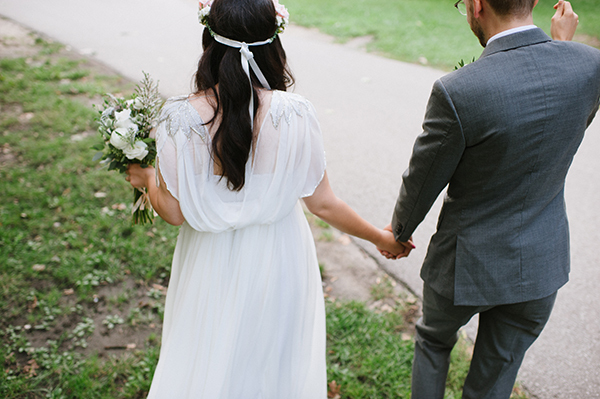 Your dress is so beautiful - here's to draping, sleeves and sparkly shoulders! I had to hunt high and low for a dress with sleeves and for a dress that was short but not a 50s silhouette and then stumbled on mine just under 2 weeks before the wedding. I was telling myself that I would find something in New York in the days before if I needed to but it was such a relief when I spotted the dress on the Sandro website and it was on sale! Thank you so much. So glad you found your perfect dress. Just delicious. Yay for the non-sleveless brides! há dois dias que estaciono o carro junto de uma loja de vestidos de noiva e dou por a sonhar com o vestido perfeito, já que os da montra não me seduzem e este teu é lindíssimo. é muito inspirador, parabéns. obrigada pela partilha e votos de felicidade para o casamento. What a seriously glorious dress. So nice to hear about all the little details in it! And I love your rebellions from the norm, I agree entirely. As someone suddenly in the market for a wedding dress, I'll be keeping all these things in mind as I hunt for my own!